Home / Stock Picks / Hot Stocks / Safe-Haven Assets: Should You Buy Cryptocurrencies or Gold? Safe-Haven Assets: Should You Buy Cryptocurrencies or Gold? In these uncertain times, it pays to have a safe-haven asset on your side. But which one? So far, the answers to those questions have been “no,” “yes” and “maybe,” respectively. While those answers may change in the future, one thing that is starting to change now is interest in a new breed of potential safe-haven investments — cryptocurrencies. Cryptocurrencies, like Bitcoin and Ethereum, are encrypted digital assets that are tracked on a decentralized network — typically a “blockchain” — to prevent double-spending of the assets (If you are unfamiliar with any of these terms, A Brief History of Blockchain: An Investor’s Perspective is a fantastic primer to get you up to speed). 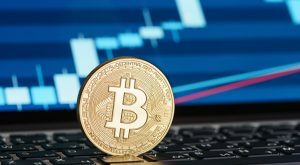 Bitcoin and Ethereum have become hugely popular during the past year, as investors have become increasingly concerned that the current world order and bullish market environment may be disrupted by populist uprisings (like “Brexit,” the election of Donald Trump or the rise of populist parties in Europe), geopolitical instability (like conflicts in the Middle East, increased missile tests in North Korea or Russian activity in Syria, the Ukraine and elsewhere) or the withdrawal of stimulative monetary policy by central banks around the world (like the European Central Bank tapering its quantitative easing program or the Federal Reserve reducing the size of its $4.5 trillion balance sheet). Just look at how the value of these two cryptocurrencies took off earlier this year. 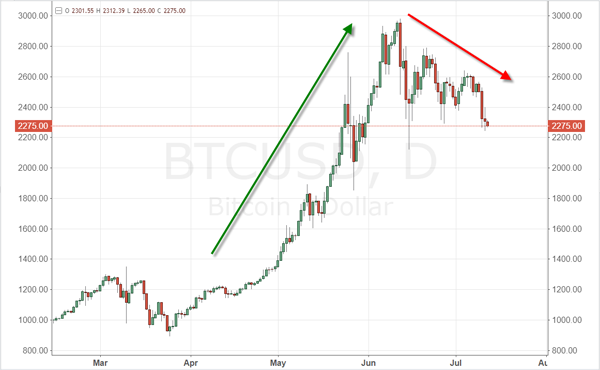 From late March to early June, the value of Bitcoin rose from a low of $891.33 to a high of $2,980 — a 234% gain (see Fig. 1). During that same timeframe, the value of Ethereum rose from a low of $16.51 to a high of $412.21 — a whopping 2,397% gain (see Fig. 2). While seeing the incredible performance of these two cryptocurrencies earlier this year may make them look like the perfect safe-haven investment during a tumultuous market environment, the bullish upswings are only part of the story. Looking at the same two charts, you can also see that these cryptocurrencies are subject to substantial pullbacks as well. Bitcoin has dropped from a high of $2,980 to a low of $2,242.62 — a drop of 25% — during the past month. Ethereum has dropped from a high of $412.21 to a low of $169 — an incredible 59% drop — during that same period. This type of price action makes cryptocurrencies look more like penny stocks or small-cap biotech stocks than stable safe-haven assets. Gold has been bouncing back and forth without really gaining much ground during 2017. 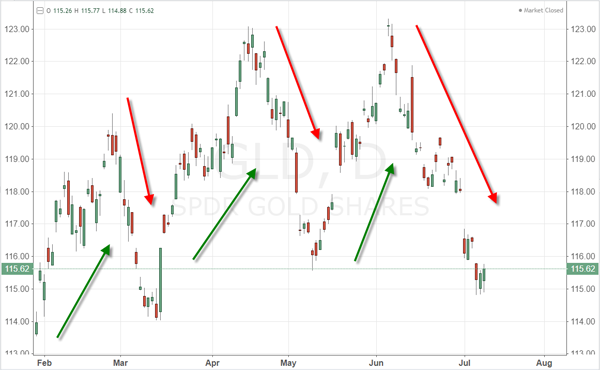 The SPDR Gold Trust (ETF) (NYSEARCA:GLD) has reached as high as $123 this year, but it is currently back down at $115 (see Fig. 3). This price performance may be somewhat disappointing compared to that of Bitcoin or Ethereum — even taking into account their recent pullbacks (so long as you bought the currencies before the big run-up) — but there hasn’t actually been much safe-haven demand for gold this year. After all, the S&P 500 is still near all-time highs. The real test for gold and the cryptocurrencies is going to come when the stock market enters bear-market territory. Gold provided a solid safe-haven during the financial crisis of 2008 and beyond and will likely do so again during the next recession. Bitcoin and Ethereum have the potential to do so, but they are unproven and carry additional risks. 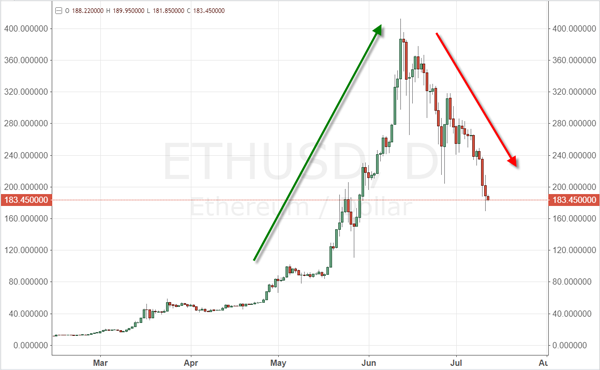 For example, the business growth and development that is anticipated, and necessary, to push Ethereum higher may stall during the next recession, sending the value of the cryptocurrency lower. It all comes down to your risk tolerance for your safe-havens. If you want to shoot for the moon, Bitcoin or Ethereum might be for you. If you want stability during uncertain market times, gold is the tried and true bet. Article printed from InvestorPlace Media, https://investorplace.com/2017/07/safe-havens-should-you-buy-cryptocurrencies-or-gold/.